This flagship Bourbon has history in every sip. There has been Whiskey made on the site of the Buffalo Trace Distillery in Frankfort, Kentucky, for more than two hundred years. The first distillery operation that can be continuously traced to Buffalo Trace was started in 1812 by Harrison Blanton (yes, that Blanton). He sold the operation in 1870 and it was renamed the Old Fire Copper (O. F. C.) Distillery. It has been bought and sold many times over the intervening decades, but Sazerac has owned the property since 1992. They produce a wide range of Bourbons and spirits — including their signature Bourbon. Not only is the Buffalo Trace signature Bourbon beloved by its fans, it’s also really good and not overly-priced. In fact, it has become the flagship of the Sazerac Bourbon line-up. They keep the mash bill tight — Corn, Rye, and malted Barley with no Wheat filler. It is also aged at least 8 years and served up at 45% ABV. All that means rich, classic Bourbon flavor in every sip. For many Bourbon fans, Buffalo Trace is their “go-to” daily drinker and we think it would be hard to make a better choice. Buffalo Trace has a capacity of about 2.7 million gallons per year — enough to fill about 51,000 barrels. This is especially impressive since everything passes through a single, 60,000 gallon beer still (wash type). What does Buffalo Trace Bourbon taste like? The Flavor Spiral™ shows the most common flavors that you'll taste in Buffalo Trace Bourbon and gives you a chance to have a taste of it before actually tasting it. Caramel, plenty of butter, warm mixed nuts, pumpkin spices. Butter toffee, mint, fruit cake. Medium length with lingering sweet and spice. Just an all-around great spirit, especially at the price. Exceptional at this price point. Has a sweet finish. One of my favorite mixed drinks is a Manhatten. This bourbon has that same taste I look for when I make one. The obvious difference is this is straight on the rocks In stock at my local shop far more often than available here. For the money, it’s one of the best things going. Smooth, just the right amount of sweet on the end, and good flavor. Tried it yesterday. Extremely smooth. Really satisfying. it has been my go to Bourbon for years. Hard to get however sometimes. Great flavor. Smooth finish. Take it neat as an end of the day mellow and you can't go wrong. Great neat or mixed. Try hancocks réserve if you like this one. Based on a price to quality ratio is why I give BT Bourbon 10/10. I have tasted Pappy Van Winkle 15 and 23 year! $3000 vs. $30 makes up for whole lot of taste in a very excellent Bourbon from Sazerac! Smooth but good. Very subtle bite and hint of sweetness. Great all around bourbon. Great as a mixer or on the rocks. Definite smooth bourbon. The palette will get some vanilla and spice as the Buffalo Trace flows over. Everyday for Buffalo Trace - it replaced the Woodford Reserve that was the standard. Buffalo Trace is solid. My go to bourbon. Smooth and mellow. My go to, everyday bourbon. Smooth, with a nice finish. Not expensive, so I don't feel guilty having it often. I really do love this bourbon but annoyed that Flaviar has been "out of stock" for now 2+ months. Just bought a batch online at a retailer so my home bar supply doesn't run out, but c'mon Flaviar. Great for price. Has a flavor I can’t quite put my finger on. Dessert sweetness that ends with a peppery note. I love the taste and how smooth it goes down. Good to keep on hand to share with friends that may be less discerning. Certainly great for the price, just not one that I sip on my own. I HAVE TWO STORE PICK SINGLE BARRELS THAT I HELPED PICK, AMAZING STUFF FOR THE PRICE. Think this shall be my “go to” bourbon. Excellent bourbon and a good reasonably priced entry into the world of bourbon. This is bourbon. Just straight up, old fashioned Kentucky oak aged whiskey as straightforward as it gets. If you like this, you should definitely explore the other bourbons out there. I guess I am dropping my review a bit because I LOVE this bourbon but suddenly Flaviar doesn't have it - keeps getting Wishlisted! Very disappointed! Smooth, great to sip on! My go to daily bourbon. Drinks well neat or in a cocktail. Always a good go to bourbon. Some think it's too sweet, but for me, it's almost perfect. Great bourbon and easy to enjoy. Highly recommend this for any one! I keep this on hand for old fashions. Great paired with oranges. Smooth and goes down easy. I think for the price this bourbon is the best bang for the buck. Normally you have to pay at least double the price to get a drink this smooth. Oh yeah! Love it. Neat. For the price, it's hard to beat! I dare not rate it 10 stars as I’m fairly new to whiskey, I have had a few different bourbons and this one is by far the best one I’ve had yet. Sweet creamy notes on the nose, and smooth Carmel on the tongue with a bit of rye and oak on the back side. Wonderfully smooth and calm And the price is outstanding. This is very smooth and delicious bourbon. I rate it as one of the better bourbons I've tasted! Enjoyed the finish and holds its flavor on the rocks as well as neat. Nice mix of Carmel, oak and spice. Agree. If you like this, give Eagle Rare a try, smoother yet for only a couple dollars more per bottle. Jim Beam is often touted as being the base-line for the quality of bourbon. Yes, Jim is fine, but something about it just feels off. The best way i can describe my feelings is by comparing Jim and Trace to Coca-cola Classic and its cane sugar "Mexi-Cola" counterpart. Trace (like Coke's cane sugar product) feels fuller, richer, more complex in its taste. Compared to Jim, back to back against Trace, it feels lacking, hollow; like something is missing. A lot of people share my sentiment; Trace feels more like the gold standard for quality. Each bottle has consistent taste between one another. This is our Go To Bourbon! It has the Carmel and Vanilla undertones, a slight smoke, perfect for the nightcap, neat or a single cube. Affectionately named "Tatonka" in our house we have shared our love of this Bourbon with dozens of friends and strangers as it was shared with us by a couple we met one evening and started a chat about their favorite Bourbon....pay it forward, grab a bottle you will not be disappointed! Very smooth, liked it very much. If you like a glass of bourbon as "dessert", this will work just fine! For the price, it's an excellent end to an evening meal. 2nd only to Willetts Pot Still Reserve for a sweet night cap. Smooth and sweet, which I generally like in a bourbon, but somewhat one dimensional. Good value for the price though! Good price point, smooth, and easy to drink. This is my go to Bourbon for a casual everyday tipple. Just an excellent drink, at a very reasonable price. However it's hard to find. Not the greatest to drink neat. Fine when mixed though. Has some oak taste in it, two cubes of ice and that's it. The Buffalo is the best daily drinker I have in my stable. Smooth and a very nice finish. Smooth and sweet; very good value. This has been my go to bourbon for parties and even just to have constantly stocked for guests. Consistently one of the very best bottles you can get in its price range. If your grocery store has a few other options and this, go with this! A good, easy to drink bourbon that is an affordable introduction to whiskey and a constant in my bar. Very smooth great bourbon for the price. My current whiskey of choice due to the flavor as I like my whiskey on the rocks. I would never mix this with anything other than coffee on those rough mornings. Anybody rating “Old Reliable” anything less than 8 stars have dumb taste buds. Buffalo Trace replace Maker’s Mark as the constant bourbon in my liquor cabinet about 10 years ago. Best bang for your buck bourbon out there. Sweetest Bourbon Ive ever tasted. I dont hate it, but its a one and done cause of that. Rich, dark, smokey, sweet. Little bit harsh, but not bad. Easily one of the best everyday bourbons. Easy drinking and smooth at 80 proof. By far my favorite whisky right now. We have been drinking this for about 3 years. It is fantastic neat or mixed with ginger beer. Perfect summer lake drink. It is hard to find. This is my go to affordable bourbon. It undercuts so many, yet punches well above its weight in flavor and quality. It's quite smooth for a bourbon which many love, but I prefer more spice and kick like its older brother, Eagle Rare bourbon. Tastes like seeing an old friend that you haven't seen in years. Excellent. Eagle Rare is a nice substitute. Nice basic bourbon. Good bang for your buck. Smooth and delicious. Not a sweet profile, not for the novice. Nice and balanced, easy to drink. High dollar whiskey at an Evan Williams price. Paid 31 dollars for my bottle so it’s perfect to either enjoy every now and then or to pass around the fire at a hunting camp. Recommend either straight on the rocks or mixed with coke. Good standard bourbon from my favorite Bourbon distillery. one of the smoothest bourbons one can sip. carmel, brown sugar notes . well balanced flavor and hotness. Decent but not my favorite. Great everyday pour. Goes down easy with sweet and cinnamon flavors. A great drinking Bourbon, especially for the price. This is my "go-to" for a normal drink or when I have friends over. Classic bourbon flavor. Charred American oak is present. This is what bourbon should be. Well rounded. Long caramel finish. Yum. Love this bourbon. My go to drink. Smooth, deep, rich Flavour. I prefer neat. Accentuates the depth and fruit. Just tried this one for the first time on 6/17/18... love it neat... very smoothe... lower abv, and enjoyed it. This is my go-to bourbon. Love it on the rocks and in mixed drinks. Hands down the best go-to bourbon and at $30 a bottle it’s absolutely a steal. My go-to - love this! A easy, inexpensive go to when I just want a taste. Great everyday drinker from Buffalo Trace. Not sure why people freak out about it and it disappears from shelves in 5 minutes. Its good but for the money, go get a bottle of Henry McKenna 10 Year. It blows BT out of the water. Great taste. Really smooth and not too sweet. You can tast the caramel, fruit notes, and a little spice. Nice smooth finish on the palate. It’s very silky smooth. It lightly lingers so of course the next sip is quick. I liked it a lot it will be a daily sipper. Can't go wrong with this one, especially for the price. Smooth vanilla and caramel notes,cherry and oak. Short finish but a pleasant afterburn. Great over ice and in cocktails. Solid conventional bourbon with a nice residual sweetness. Good choice mixed or neat. Very smooth, great for sipping! Very smooth, not a huge bourbon drinker but I’d sip on this one. Decent on its own and like it way better than the JD my wife like to have with Coke. One of my favorite pours for the price. Sweet upfront with butter, spicy on the back end. Loved it. me personally it had almost a camel toffee taste and nice finish. Just about the best everyday pour you can find for the price. Perfect for any occasion. Good sweetness and nice long finish that slowly builds in spiciness. Great for sipping and mixing. Sweet caramel notes early with a spicy finish that lingers for a bit. This is a well balanced, full flavored bourbon. Thick, creamy, and heavy in caramel and vanilla notes. One of my go-to’s that doesn’t break the bank! I use Buffalo Trace for making Old Fashioneds, and it simply doesn't get any better! My favorite go to bourbon - incredible value. Shows how good wheated bourbon can be! One of my favorite bourbons and not overpriced. Some bars even use this as their well. One bourbon I always keep in stock. Great caramel notes with a small bite. Works well as mixer or on the rocks (my preference). Smooth, a little sweet. Good base bourbon for both mixing and sipping. I’m a fan. Sweet upfront, spicy in the end. For the price its pretty good, and it makes for great mixers. But, Michter's US*1 having a similar flavor profile is much better for sipping. If all bourbons were to disappear off the face of the earth, I'd be most upset at the loss of Buffalo Trace. Considering its very affordable price and wide availability, and factoring in its 'can't find anything wrong with this' flavor, I'd name this the best bourbon on the planet, with a very close following by its big brother, Eagle Rare. To me this had a spicy taste with notes of oak, cinnamon and caramel. Smooth caramel and vanilla with a hint of fruit. Definitely a great bourbon for the price. Got a store pick single barrel. Very good for price and recommend if you can find a store pick. Nothing crazy for spice, heat, flavor, but a good bourbon. Makes a great whiskey sour and doesn't burn on the way down. Overall excellent bourbon for the money. Much better than some of it’s more expensive counterparts. One of my go-to, everyday bourbons. Cocktail? Cost effective enough to use. Neat or on the rocks? Perfectly smooth enough to just pour in a glass and enjoy. It doesn't try to be anything its not. Buffalo Trace Kentucky Straight Bourbon is a wonderful standard. I think it comes off less sweet than Jack but sweeter than Jim. It has all the standard bourbon notes without any bells and whistles. Obviously there are better bourbons out there but this is a solid bourbon at a good price. Better mixed but decent on its own. Nose: caramel, vanilla Taste: caramel, toffee, cinnamon, pepper, dark fruit Finish: caramel, vanilla, woodiness Smooth and satisfying. Almost like a dessert. It’s a very sweet and easy to drink bourbon. It’s great for beginners. Smooth and light on the palate with subtle hints of vanilla. Easy to drink straight and wonderful with some blackberry! Smooth taste. Good on ice. Sweet but simple. Best on the rocks. Best tasting from the bottle and one of my favorites. Doesn't seem to change its flavor from distillery to home. Favorite of my in-laws. I didnt care for it at first, it seemed a bit hash, but its grown on me over time. Still a great value. Nice balance and everything you need for a great neat sipper, on the rocks, or flavorful enough to shine in a cocktail. Very attractive nose of oak with some vanilla and red delicious apple peel that also shine on the palate. Slightly sweet and smoking, and as smooth as it is complex. Lovin’ it! Good luck finding a better bourbon, especially at the price point. I was able to enjoy a bottle of Buffalo Trace Bourbon Single Barrel Select, 2017 which had a creamy birth of spicy molasses; a life of of brown sugar & cinnamon, that lead to a long death of dry oak & leather. Very nice on the rocks, especially for the price. Great for always having in the liquor cabinet. Probably the best value in bourbon! Vanilla and spice, and everything nice. Great sippin' bourbon for the price. I enjoy a smooth, round flavored bourbon--one with a comfortable heat in the palete. 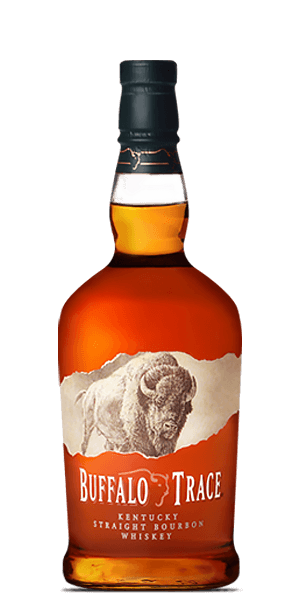 Buffalo is a go to bourbon for me and a must have on my bar! I loved it. I detected the honey and vanilla , slightly spicy , and a bit smoky. Very enjoyable and smooth. Great bourbon with flavors that are the epitome of what bourbon should taste like. While not the best, definitely tasty and a great price. Would keep this stocked in my bar. Love the drinkability with its smooth and clean medium finish. A very good Bourbon as your go to anytime, and what a Great Price! A great bourbon. Smooth from start to finish. This bourbon when allowed to age to 10 years becomes Eagle Rare. Love it. Smooth and clean for the price. A go to. Very drinkable, smooth sipping whiskey. Very drinkable in a mixed drink or just sipping it by itself. Very smooth. Better flavors out there for the same money. Sweet. Vanilla. Smooth. Very little heat. Went great in a Godfather. Good for the price. Personally it's just a bit too sweet for me. Just a great everyday sipper. Smooth and tasty.